Yesterday, I received information documenting Timothy Chaz Stevens psychiatric disfunction, which can be read here. I promptly posted the information because the public has a right to know what kind of person our elected officials, including U.S. Representative Allen West are listening to and taking advice from. I received many emails in my inbox, many of them from individuals looking to support and help walk Mr. Stevens through his 12 STEPS to Sobriety and Sanity. But, I received one which sparked my interest and attempts to clarify the legal "jargon" from the court document detailing the outcome and conditions of Chaz's run-in with the law. Just what I suspected all along. Look carefully at the form. About 1/5 of the way down, last typed line before the written part - "Defendant to plead guilty. Sentence to be passed if defendant returns with proof of"....laundry list. 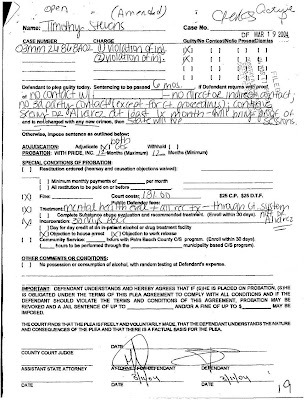 This was a deferred disposition- the form was started by the state's attorney's office (the filled in typed parts) and the rest haggled written and filled in, and/or added by the judge, when Chaz went to court and plead guilty on that date. Acceptance of the plea of guilt was witheld by the court, provided Chaz did all the prescribed stuff, which he apparently successfully did, and the plea was never entered. This is common with 1st time offenders, to give people who made a mistake and learnfrom it an opportunity to mend their ways and not have a criminal record of the conviction. 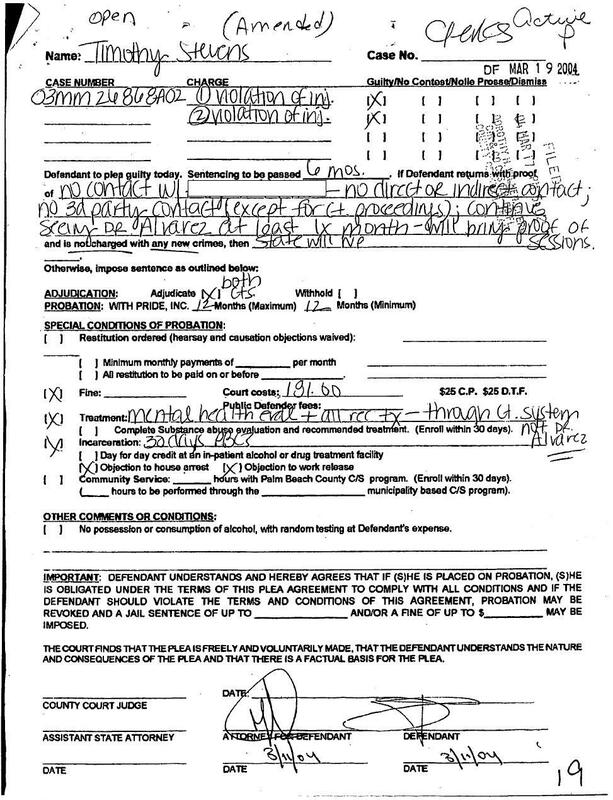 This case was probably a little grosser than some 1st offenses, so getting deferred disposition--even with the psych evaluation, was a nice piece of work by Wright. But, deferred disposition doesnt change the fact that Chaz Plead Guilty and admitted the allegations, right there on the disposition form. Now, if that is the case it seems funny that Chaz over on MAOS indicated that these allegations were all rumor and lies. Yet, he complied with the Judges order so the adjudication could be withheld. I think he not only needs AA, but needs to return to psychiatric treatment for professional counseling for his delusions. Dr. Alvarez do you have any appointments available for your old friend Timothy Chaz Stevens.